My prodigious love of neon lighting is showing no signs of waining as I see more and more ways to add this playful aspect to my home. It is not always cheap to purchase though, especially if you are looking for a bespoke piece, but there is a new player in town that is changing all of that. Here is Bag and Bones.......where you can get a neon piece of art, off the shelf or bespoke, for a very reasonable price. 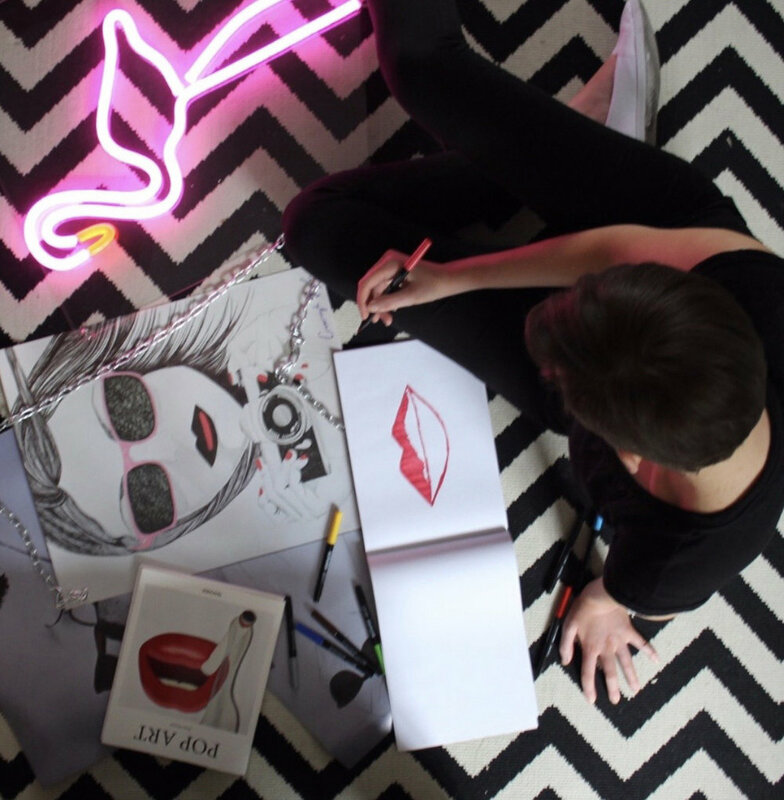 I have long since admired Gigi and Cavanagh Foyle at Bag and Bones and recently managed to bag some of their cool neon lips for my recent bedroom transformation, and so I am delighted that they are one of the first businesses that I get to write about on this blog. Bag and Bones is an innovative LED neon art label grounded in high quality unmistakable design. Based in London, founder Gigi Foyle and her team work alongside her Dublin based sister Cavanagh, designing unique neon lights. Created over the course of two years of meticulous research and preparation, the seed for bag and bones was first planted when Gigi spotted a gap in the market for a new type of neon that was more environmentally sustainable and just as beautiful as traditional glass neon. “we want Bag and Bones to be all about fun and joie de vivre but it’s really important to use to create products that limits the impact on our environment” says Gigi “our neon balances that care free attitude on one side and that sense of responsibility on the other. I’ve always loved neon. For as long as I can remember, the seductive glow of neon has held this power over me. It just has such a positive effect on my mood – I have bag&bones neon all over my house and whenever I turn it on my mood is instantly uplifted! It was an idea in my mind for over 5 years and I kept coming back to it, but didn’t quite have the courage to do it. It’s quite a big leap to set up on your own. At the time, I had a good job (my background is also in Science) a pension, a mortgage to pay and two young children to feed. But, I knew if I didn’t do it then, I’d never do it. So, I took a leap of faith and haven’t looked back since. It’s been an amazing roller coaster – I’ve loved every second of it and my only regret is that I didn’t do it sooner. But then again, I think everything happens at exactly the right time for exactly the right reason and here I am, one year in…I can’t quite believe my luck! We started off working from my kitchen table but we’re just in the process of looking for an office space. After my second maternity leave, I took voluntary redundancy from work and used the money from that to invest into the business along with investment from my family…I couldn’t have done it without them and their faith in me. Time management; there is just so much to do and it is not always easy to find the time to do everything! I don’t think we realized how time-consuming it would be. We are literally working all the hours of the day but don’t get us wrong: we love what we do, and we’re not complaining about it! But we have had to be strict on how we manage our time. While we would love to spend our days drawing up new designs and out scouting for inspo, there is the whole other side of the business; managing the finance, doing the accounts, sorting out the packaging and the shipping – not glamorous but vital! I think living in London, and having access to so many amazing organisations and groups that help start-ups, means we’ve been lucky and have been able to tap into all of that. I love London and living and working here inspires me. There is so much going on, and so much to look at if only you take the time to look up from your phone! There’s beautiful street art and graffiti around every corner, and some of the best museums in the world. There’s something beautiful and inspiring waiting for you everywhere you go – from derelict buildings to gleaming new-builds. I love that about London – it will never get old and I will never run out of ideas as long as I am roaming the streets of London. Oh there were so many learning curves in the first year! My passion is art and neon but when it comes to retail & selling, I had absolutely zero experience. We had to teach ourselves everything from what to price our lights at to how to write a press release. We were literally googling ‘how do you build a brand”!! Well as cheesy as it sounds, I’ve learnt that if the passion is there everything else will follow – you can teach yourself most things but passion is cultivated through love, dedication and drive. Oh that’s a tough one…I almost don’t feel like we’re qualified to advise! We’ve been on such an amazing journey but it’s also been a massive learning curve…running your own business is hard but I wouldn’t change it for the world. If you’ve got an idea and your passionate about it and you can see there is a niche in the market…then go for it! Also get a mentor – it’s invaluable to have someone that you can turn to for advice as and when. Someone that is not family or a friend is best as their advice will be impartial. They don’t necessarily have to be in the same business but it helps if they are in something similar. It is interesting to see so many themes that run through Gigi's response to my questions that are common to all first time business owners. Word's like "rollercoaster" "having to earn lots of new skills" "finding time to do it all " come out time and time again when I talk to first time entrepreneurs. It is normal to feel overwhelmed, sometimes lonely when you are running you own business, but another theme that should keep everyone going is that if you have enough passion and a real gap in the market, then with the tenacity to learn the rest, and more importantly with a good mentor and an eye on you money, you stand a good chance of making a success of it all. Gigi mentions that while not glamorous, it is important to be on top of the business "stuff", like accounts, tax, legal. It is no good having a brilliant idea if you run out of cash because you have not got you eyes on your accounts. Equally your business may fall over at the first hurdle if you have not thought through your product and how it fits into the market. You need a niche, a reason of people to want to buy and an ability to articulate it. Gigi's branding is incredible as is her ability to promote her business. Thanks Gigi for sharing this with me.